As more and more rubber products are producing, more and more waste rubber is coming along. Generally, we regard waste rubber as trash, so we dispose waste rubber by incineration or burying in landfills. But now, in order to protect the environment and deal with waste rubber in a beneficial method, Beston has been engaged in rubber recycling for several years. With continuous researches and innovations, we have launched the latest rubber recycling plant for sale now! 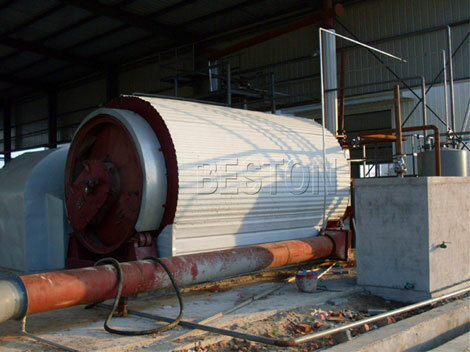 The rubber recycling machine manufactured by Beston Machinery is also called rubber powder production line, which refers to crushing the whole tyres into small rubber granules and powder with the size of 30 to 200 mesh. It utilizes a variety of conveying equipment and separation technologies to minimize products loss, maximize production efficiency and maintain a safe and clean operating environment. The rubber powder from waste tyres or rubber can be reprocessed to make new rubber products, such as auto parts, rubber damping cushion, artificial turf, soles, rubber road facilities, rubber carpet, rubber floor mat, rubber modified asphalt road, rubber track, etc. 1: Steel wire remover: the single hook wire remover machine for hydraulic tyres is used to draw the steel wire from tyres bead completely in one-time, which aims at facilitating the next steps of cutting and shredding. 2. 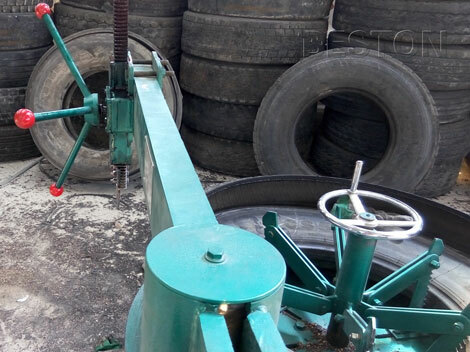 Jaw type cutting machine: this machine can be only used to cut the whole tyre whose diameter is larger than 1200mm. If the tyre’s diameter is less than 1200mm, it doesn’t need this step. 3. Comprehensive tyre shredder: it is mainly used to shred the whole tyre into rubber blocks of 50 mm. 4. 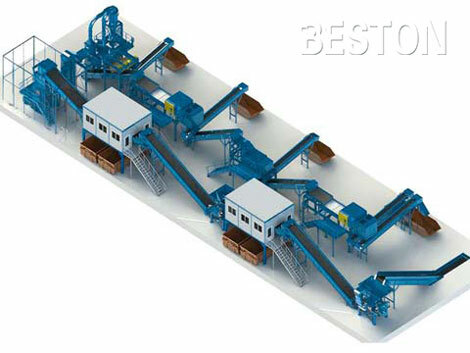 Belt conveyor: it is utilized to convey the whole tire and rubber blocks. 5. Coarse crusher: having been crushed into rubber blocks of 50mm by the shredder, the tyres are conveyed to the coarse crusher by the belt conveyor. The coarse crusher can crush the rubber blocks into small size of 2-15mm. 6. Fine crusher: it can mill the rubber blocks into 2-3mm small particles. 7. Screw conveyor: the conveying equipment can connect each machine if required; it also can separate rubber powder from rubber granules. 8. Coarse fiber separator: the equipment with high performance can separate rubber granules from fiber. It is efficient to improve purity of granules. 9. Rubber powder classifier: the classifier can separate rubber powder into light powder and heavy powder when the powder is high-speed boiled in negative pressure condition. 10. Rubber vibrating magnetic separator: this device is utilized for screening of rubber granules. 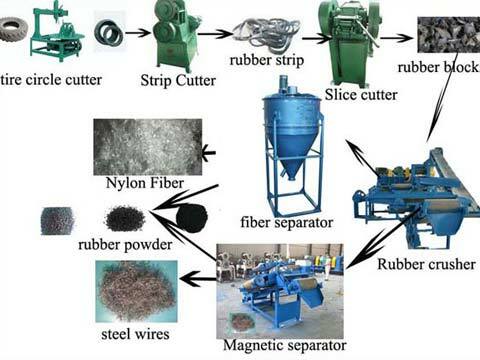 Use steel wire remover, jaw type cutting machine, tyre shredder and belt conveyor to recycle waste rubber for further reprocessing, such as making rubber powder and granules, or being used as pretrement equipment of tyre pyrolysis plant. Beston has the advanced rubber pyrolysis plant to deal with waste rubber with high efficiency. The plant can convert waste rubber into fuel oil, carbon black and steel wire (only for tyres) by high temperature heating. All of the final products have a wide range of applications and fetch good prices in the market, which will surely bring you great benefits. Especially the fuel oil, it also can help relieving energy crisis. The plant has been proved to be a success in recycling waste rubber. Inquiry us at any time.